Hi there, me again on car rack blogs. This time is Top 3 Thule Bike Rack Review under $500. Feel excited – right? Thule is no longer a new brand if you have searched for the best car crack before. Hence, you already know that Thule bike racks are versatile, decent and durable. In this article, I will share some thoughts on the three best Thule Bike Racks coming at less than $500 for all cars. Hope it is helpful so that you can invest in the most suitable racks to enjoy endless cycling. No beating around the bush anymore! I will introduce today’s list right away. 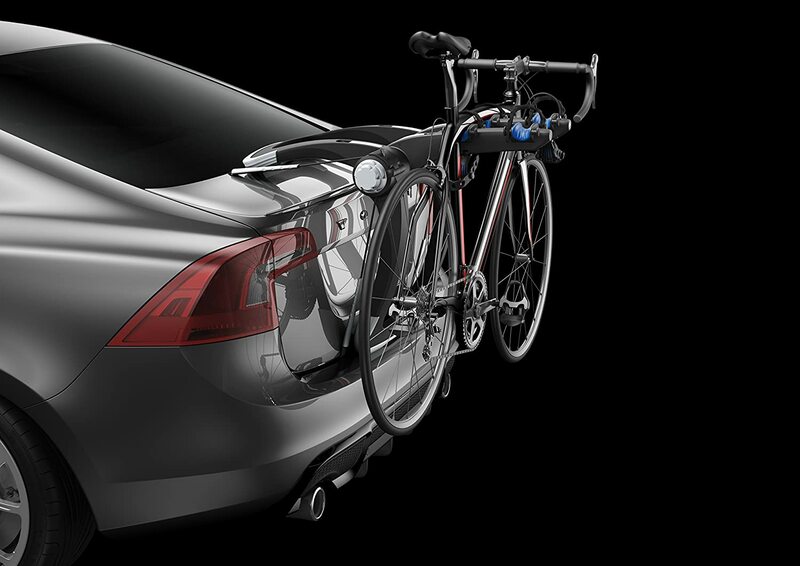 Does any Thule Bike Rack catch your eyes? Then, its full review is available right below. This 598001 Roof Bike Rack is ideal to carry lightweight bikes thanks to its grid-like rubber jaws, which not only compress around the bike’s brake hoses or gear cables but also conform to tube shapes. You can set your mind at rest since the bike is kept from falling on the transporting way. What’s more, the outstanding torque limiter feature does a good job in controlling the force going to the bike frame. It secures the bike from scratches or damage. Load up to 20kg and even fit “fat bike”, but for 1 bike at a time. The instruction is like a toilet paper. You should visit Youtube to learn the assembly tutorial. A small but annoying experience that Thule should improve in later versions. Mounting the rack to the roof bar often takes time. It also causes wind resistance as well. Whereas, the hitch-mounted rack is easily swung off on driving. Many people would like to connect the bike rack to the trunk of their vehicles. 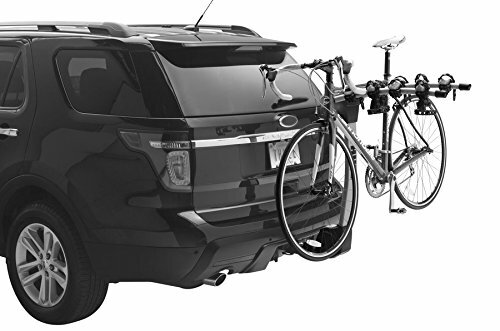 If you have the same idea, check the next product on the Thule bike rack review – Raceway PRO Trunk Mount. This tool is straightforward to install and even safer with the Sure-tight ratcheting cables rather than the woven straps like many others. To be specific, the bikes are secured to the rack and the rack is also locked to the car. Moreover, there are coated soft cradles to keep your bikes shake-free by absorbing shock on the way. Besides, the rack’s arms can be folded at ease. That means I can unmount and keep this Thule Raceway PRO from the eyes of thieves. Honestly, this tool does not go cheap so better safe than sorry. It is able to carry up to two bikes. If you want more, it’s impossible because the rear is not empty all the time. This Thule bike rack is a bit heavy compared to others I have used so far. Anyway, it is still acceptable. In case you have one bike, the car roof probably is a good place to mount that vehicle. However, if you seek for Thule bike rack for a family riding picnic, you need another choice. That time, I recommend the Apex 4-Bike Hitch Rack. From its name, you can figure out that this tool can load up to 4 bikes in one go, a great capacity. Not to mention, the unique Apax Swing design prevents your rear compartments from the direct access to the bike, even in case of a full load. Accordingly, you do not have to worry that your bikes might move back and forth on driving since there are Holdfast shock-absorbing cradles. With the Thule Apex, the EasyMount system makes the installation effortless without any tool needed. The cable locks to hitch and onto the rack itself. It means you can lock it and forget it. Without the key, it is a challenging task for the thieves to steal both the rack and bikes away. But, the first condition is that you keep your key under safety. I had no luck with the assembly due to the size and weight of all components. It took me nearly an hour to get it done. The Arc design keeps my care from accessing much to the rack, and my bike frame is under stress. The reason is this Thule Apex Hitch Rack utilizes the frame as the attachment point. Have You Had Your Own Choice? From this Thule Bike Rack review, I hope you can eventually invest in a rack under $500. If you still cannot find the best, feel free to leave your requirements below. I am willing to recommend other suitable choices for you.